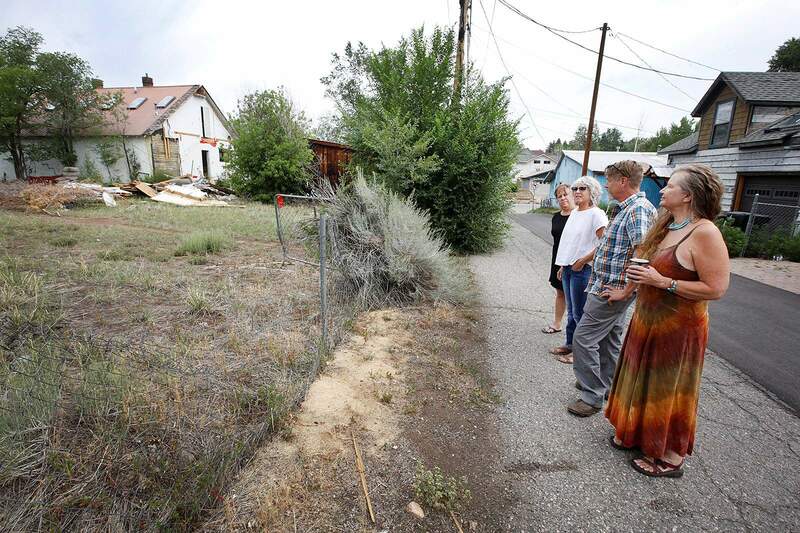 Concerned East Third Avenue residents from left, Tracy Campbell, Debra Morgan, David Tart and Sally Florence look over debris on the lot on East Second Avenue that will soon be developed into two hotels. They said they have asked for trash to be removed for months. Two six-story hotels are planned for East Second Avenue between east Fourth and east Fifth streets. The hotels are expected to bring more traffic and noise to the area. A restaurant previously expected to be part of the project has been eliminated. Two hotels will be built on East Second Avenue between Fourth and Fifth streets. The hotels project was originally approved in 2014. Residents near two forthcoming six-story hotels on East Second Avenue south of College Drive are unhappy because the development will likely increase traffic, noise, dust and parking problems in an already-congested area. The city approved the development of a Hampton Inn and Suites hotel and an AC Hotel by Marriott between east Fourth and east Fifth streets in 2014. The inns, across from Gazpacho’s, are planned to have about 200 rooms combined. Construction will likely start in one or two weeks, said Luke Wietgrefe, project manager with the Rio Grande Group. 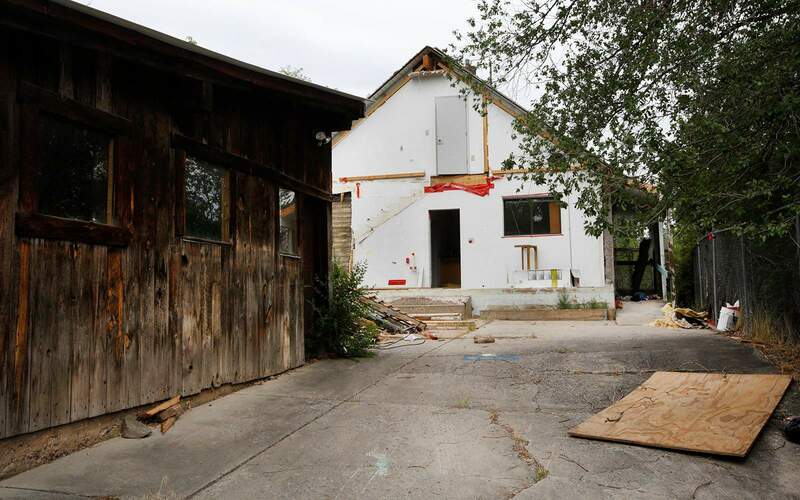 The city has already issued developers a demolition permit for vacant structures on site, and an excavation permit is expected to be issued soon, Nicol Killian, assistant director of the Community Development Department, wrote in an email to neighbors July 18. Neighbors, including some who share an alley with the development, met with the city and developers to express their concerns and ideas for mitigating noise months ago. But they said few adjustments to the plans were made. “There are several issues now the residents in our neighborhood are quite up in arms about,” said Debra Morgan, who lives on east Fourth Street. Some homeowners accept that the development is coming, but they think adjustments could mitigate long-term impacts, such as noise and traffic, the hotels will generate. A lack of response to repeated requests over several months to clean trash on site and contain it in a dumpster has also frustrated them. “There is no reason why a construction dumpster could not have been landed on that site and that area cleaned up,” Morgan said. “There is nothing the city or the developer can tell me that makes this right at this point,” she said. Wietgrefe said the company was unaware of requests to clean the property. “We will remove the debris and buildings as soon as possible; this will likely happen within the next week,” he said Monday. The city told neighbors that developers had not removed trash because they wanted to hire the same company to do the demolition and excavation. The lack of action cleaning trash has surrounding residents doubtful developers will cooperate to ease the hotels’ impacts on the neighborhood. “How do we have confidence that anything they are going to do is actually going to happen, when they can’t take care of the very first thing?” Morgan said. In the short term, neighbors expect notification of construction dates and mitigation of dust and noise. Developers could use water, seed and mulch, or spray-on soil binders to keep dust in place, Killian said. When asked if the city can require developers to install a noise barrier, Killian said that the city has a noise ordinance, and city officials expect the project to comply with its noise rules. To mitigate noise from dumpsters, neighbors suggest placing the bins near Fourth Street and East Second Avenue below the homes, where they wouldn’t be as disruptive, instead of in the alley. “It’s something you can go ahead and mitigate in the beginning,” said Josh Rosenthal, a resident who lives in the 400 block of East Third Avenue. Developers eliminated plans for stairs on the south side of the hotels that would have connected East Second Avenue to Fourth Street after neighbors agreed they were unnecessary. Morgan said neighbors would like dumpsters placed on the south side of the hotels, below homes. Developers, at city officials’ request, considered the idea, but they determined it would not work, Killian said. However, developers did design hallways so trash will not need to be hauled around the building and through the alley, Wietgrefe said. 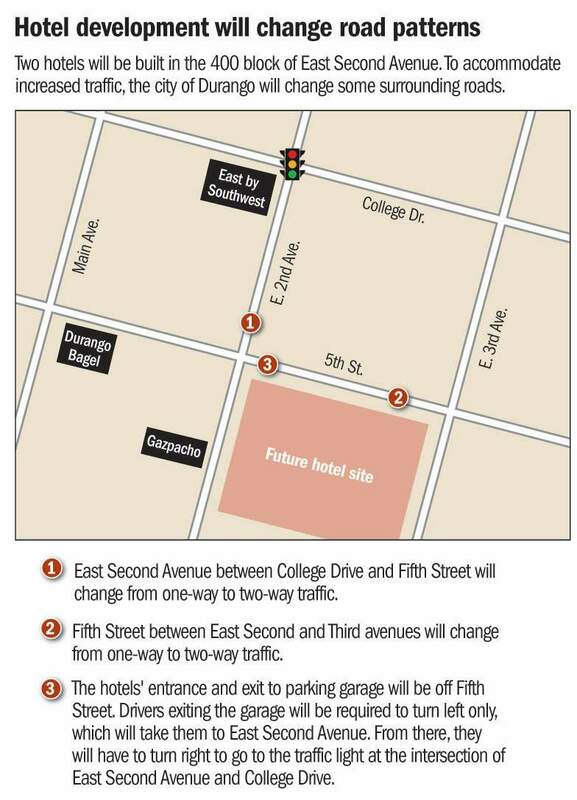 As a result of the hotels and associated traffic, the city plans to turn Fifth Street between East Second and East Third avenues and East Second Avenue into two-way streets, changes that will result in the loss of 17 parking spaces, Killian said. The hotels’ parking garage will be accessed from east Fifth Street. Increased traffic will lead to more parking problems that neighbors want addressed. To keep cars off East Third Avenue, residents suggested that the city block off two lanes on Fifth Street between East Third and the alley to the west and put in a small community park, Sally Florence, an East Third Avenue resident, said. The land-use code, Killian said, does not allow for dead-end streets, and a lack of space prevents use of a cul-de-sac that would have given vehicles room to turn around. Instead, the city plans to require drivers leaving the hotels’ parking garage to make only a left-hand turn onto east Fifth Street then turn on East Second Avenue to go north, according to Killian’s response to neighbors. But some neighbors are doubtful that a left-only sign will be effective. “Tourists don’t necessarily follow the rules, partially because they are not aware of them,” property owner David Tart said. Neighbors are also concerned the 207 parking spaces the hotels expect to provide will be insufficient. The hotels anticipate having 12 employees working overnight, and developers plans to provide the same number of employee parking spaces, Killian said, in her email to neighbors. During the day, the hotels are likely to have 40 employees and additional staff should be able to find freed spaces inside the parking garage as guests leave for the day, she said. After speaking with other hotels about staffing requirements, Tart said he suspects the new hotels are underestimating their needs for employee parking, and that will spill over to neighboring streets. “Durango residential neighborhoods are already highly impacted by employee parking,” Tart said. Some see the project as part of a larger shift in town toward a more resort community, Rosenthal said. The hotels are two of six new hotels proposed in town. “We’re going to go ahead and continue to erode what Durango is,” he said. mshinn@durangoherald.comAn earlier version of this story had a photo caption that incorrectly identified the residents as living on East Second Avenue. They live on East Third Avenue.